After many years of evil kings, Josiah became king of Judah when he was 8 years old. Josiah loved and obeyed God, and God blessed him. Josiah was only 8 years old when he became king. His father, Amon, was an evil king who worshipped idols. Amon’s own servants killed him. Josiah was very young, but he knew the people were sinning and worshipping false gods. He wanted to do the right thing and keep God’s laws. As Josiah grew older, he became more experienced and powerful. In his 18th year as king, he saw that the temple of God was in bad shape. He decided to repair it. He told the high priest, Hilkiah, to pay for the repairs out of the money collected at the temple. They hired carpenters, builders and stone workers. They bought wood and stone for the repair work. One day, as Hilkiah was walking in the temple, he spotted a scroll. He picked it up and was surprised. He said to Shaphan, the scribe, “I have found the Book of the Law in the house of the LORD.” Hilkiah gave the book (written on a scroll) to Shaphan, and he read it. This book may have been hidden away in the temple for many years during the reigns of ungodly kings. Or it may have been just thrown aside, no longer used. It probably contained parts or all of the first five books of the Old Testament as written down by Moses. Most of the Bible as we know it today had not been written at this time. 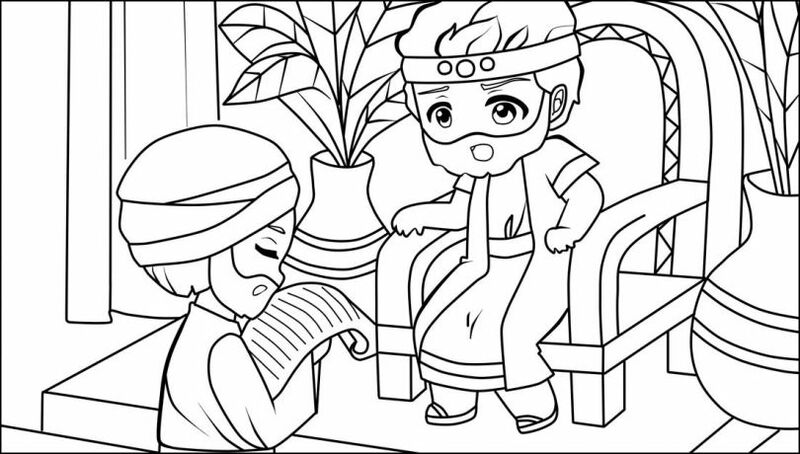 Then Shaphan read the book to the king. When the king heard the words of the Book of the Law, he tore his clothes and cried. He knew these were God’s words written down in this book. And he knew God was angry because they had broken God’s laws. Hilkiah took Shaphan and three others and went to Huldah the prophetess. The king sent men to gather all the elders of Judah. The king went up to the house of the LORD with all the men of Judah. He read all the words of the Book of the Covenant that had been found in the temple. Josiah made a special promise to God. He would keep God’s laws with all his heart and all his soul. All the people also promised. The king commanded Hilkiah and others to clean out all the idols from the temple. They were burned up. Then he went to other cities in the land and removed all the priests who worshipped idols. He broke down all their idols, altars and high places where they worshipped. Then he returned to Jerusalem. Such a Passover had not been held for many years. The king and all the people celebrated this season with great joy and thankfulness. Josiah continued to remove all the evil priests, idols, wooden images and altars. He destroyed all the places where false gods had been worshipped. As long as Josiah reigned, the people kept the laws that were written in the Book of the Law. Josiah was a very special king. He turned to God with all his heart, with all his soul and with all his might. No king was like him afterward. This young king worked hard to bring his people back to God. This story can be found in 2 Kings 22-23 and 2 Chronicles 34-35. How old was Josiah when he became king? What were the people doing that made God upset with them? What did Josiah do when he saw that the temple needed repairs? What did the high priest find in the temple? What did Josiah do with all the idols and other bad things? What did Josiah and all the people do when they found out about the Passover? This Book of the Law may have contained the first five books of our Bible. What are the names of these five books?